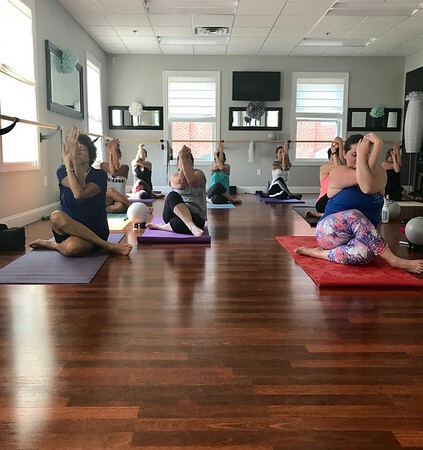 FARMINGTON - Zen Yoga Barre has added new classes and instructors, offering a variety of ways for people to improve their health and wellness. Things have been going well at Zen Yoga Barre in Unionville, according to owner Robin McPhee. Pamela Dyer, a barre instructor at Zen Yoga Barre, said that the beginner classes teach students poses and alignments. The more advanced class will combine these into a cardio workout. Zen Yoga Barre will be holding a Reiki (a form of ‘energy healing’ from Japan), level 1 certification training class Oct. 21 from 11 a.m. to 3:30 p.m. The cost is $150 to participate. Reiki Master Melissa Pieciak will lead this class. Those interested in applying can email robin@zenyogabarre.com. Class times are listed on zenyogabarre.com. These include a two-week beginner trial with unlimited classes. Zen Yoga Barre is at 37 Mill St., Unionville. For more information, call 860-414-1499 or visit zenyogabarre.com. Posted in The Bristol Press, General Business, on Tuesday, 9 October 2018 20:44. Updated: Tuesday, 9 October 2018 20:47.